World Cup 2014 Free Spins for Active Players at Klaver Casino! Discussion in 'Bonus Spins - Extra Spins - No Deposit Bonuses' started by Marina, Jun 13, 2014. 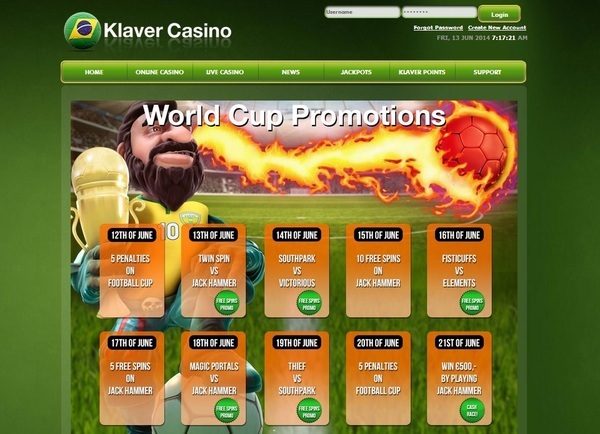 Klaver Casino has amazing promotions during the Fifa World Cup 2014 for their active customers. Players getting many free spins and some nice deposit match bonuses from June 12th until July 13th 2014. You are considered as an active player if you deposited and played for real money at Klaver Casino in the past 30 days. If you did not do that, then make a deposit today, and you can still get the World Cup Free Spins from tomorrow on. Many days if there is World Cup 2014 football/soccer game you'll get 5 free spins. You can choose between 2 videoslots. Choose your slot wisely, because this is a Video Slot contest for the World Cup from Klaver Casino. Make sure to check the Klaver Casino World Cup 2014 Calendar daily, so you don't miss out. Today's game is Spain Vs Holland, Klaver Casino players can choose between 5 free spins on Twin Spin (Spain) or 5 free spins on Jack Hammer (Holland). The 2 players with the highest win in the free spin games on the slot that represents the winning team will be rewarded with 500 free spins. Choose your winning slot/team to play your 5 free spins. Again, if you manage to be one of the 2 players with the highest win in the free rounds you will get another 500 free games. Free Spins from Klaver Casino for Men ONLY. Happy Father's Day! Klaver Casino will send you an email to let you know on which slot game you have free spins. How cool is that? You get free spins and have the chance to win another whopping 500 FREESPINS. This is really an outstanding Casino promotion for the World Cup 2014. Netherlands, UK, Ireland, Denmark, Sweden, Finland, Norway, Germany, Austria, Australia , New Zealand, and Switzerland. Netherlands won the game against Spain yesterday! Did you play your free spins from yesterday on Jack Hammer? Maybe you are one of the two players with the highest win resulting from the 5 free games? Don't forget to play your 5 free spins today at Klaver Casino! Collect today your 5 Free Rounds on the Jack Hammer Slot at Klaver Casino! Sorry, we just hear, today's free spins from Klaver Casino on Jack Hammer for Father's Day are ONLY available for male customers from the Netherlands! The World Cup Free Spins continue also this week at Klaver Casino. Make sure to check their World Cup Promotions Calendar Daily! The World Cup Promotions continue at Klaver Casino. Just login to your account and check their World Cup Calendar! On 24th June launches the latest NetEnet Slot "The Wish Master" at Klaver Casino and active players will be rewarded with no deposit free spins to play the new game.